Whether you have recently invested in Xactly, are already an Xactly customer, or are evaluating if it’s the best tool for your organization, it’s critically important that your organization has the right personnel in place to manage and administer your systems and processes. A Sales Performance Management (SPM) system is only as good as the data and processes that drive the calculations, reporting, workflow, and outbound data. One pivotal role that ensures those functions are running properly is an Xactly administrator. Xactly administrators manage the day-to-day operation of an SPM solution, help with disputes, generate reports, analyze incentive plan changes and finalize commissions calculations for payroll. You may be trying to determine if a new hire is required for this role or if you can repurpose one or more of your current team members to administer the system. 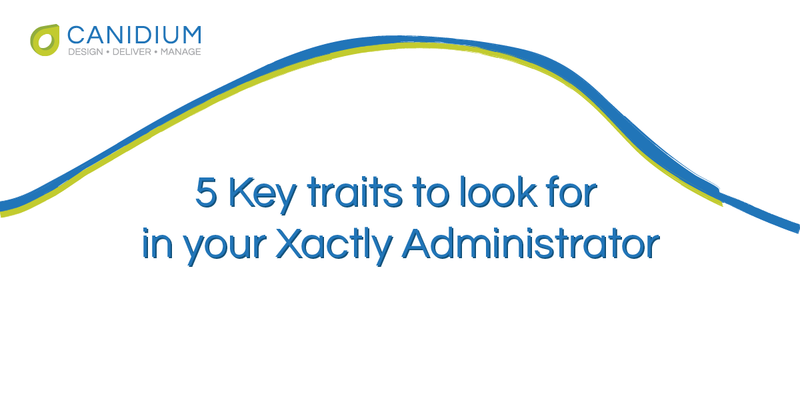 In order to make the most informed decision, there are five key traits that Canidium recommends when looking for in your next Xactly Administrator. Xactly administrators need to be able to quickly validate and understand that system calculations are accurate. Analytical skills are key to validation and ensure that efficiencies gained by investing in an SPM solution are truly realized. An Xactly administrator will use these analytics skills when addressing disputes, evaluating the impact of plan changes, generating ad-hoc reports, and responding to inquiries your salesforce has. It’s also important for the administrator to fully understand calculations within your compensation plans so they are able to validate and explain calculations to end users. Reporting and data visualization skills are also very important. Often times, your administrator may be asked to summarize compensation information and present that information to senior management. Excellent analytics skills ensure that your sales force trusts and adopts the solution by having a knowledgeable resource that can answer any questions an employee may have about their incentives. All SPM solutions are driven by databases. Your Xactly Administrator doesn’t need to be an expert in database administration, but they should be aware of some basic data best practices. Your Xactly administrator should understand or be capable of being trained to understand the underlying data that drives incentive calculations, what data fields are unique, which fields are used as keys to connect different data sources, and the processing order that is required to accurately calculate metrics and populate reports. “Garbage in, Garbage out” is a common saying when discussing data solutions. By selecting an Xactly administrator that has solid data knowledge, you can prevent the garbage from going in and negatively affecting your sales performance and calculations . One of the most common tasks for an Xactly administrator is troubleshooting issues that may arise throughout the course of a processing period. Issues can arise from incorrect data, disputes raised by payees, incorrect quotas or reference objects, etc. The Xactly administrator is the first point of contact for determining the root cause for these issues and fixing them. Your administrator should show a passion for problem solving, competence in performing root cause analysis, and properly identifying the steps that are required to fix an issue. One key trait of troubleshooting that is sometimes neglected, is preventing similar problems from happening in the future. Your Xactly administrator should show they have the skills required to solve issues as they arise, determine the steps required to fix individual issues, and develop processes to ensure that issues only need to be fixed once. One key trait that is required for just about every role is communication. For an Xactly administrator, the style of communication is particularly important. Administrators need to be able to effectively communicate technical and mathematical information to a wide variety of users and stakeholders. Administrators regularly communicate with sales representatives, sales managers, IT staff, finance, HR, and general management. A strong administrator will know how much information their audience needs and how to convey that information best. When evaluating a potential Xactly administrator, determine how well they can explain complicated math or technical details to someone who has a low technical aptitude. Administrators also will need to be able to communicate calmly with Sales Representatives who may think their pay is incorrect. Sales representatives are passionate about their incentives, so your administrator will need to be able to effectively communicate unwelcome news. The best administrators are able to use their communication skills to build trust in your Xactly solution from your sales force, drive adoption by showing value in the solution, and quickly solve problems by effectively communicating with a wide variety of subject matter experts. Xactly is a cloud based SaaS solution. An Xactly administrator should have basic computer literacy and Excel™ proficiency as they will be uploading and downloading files, navigating between different environments to conduct testing, and working with sensitive data. Your administrator should very comfortable performing these types of duties. Additionally, your administrator will need to be trained to use the Xactly platform, so look for an administrator who has shown a passion for continued learning and development. Xactly provides exceptional administrator training through Xactly University and Canidium highly recommends that your administrator attend the 3-day in person administrator workshop. Xactly University also provides a number of other supplemental training classes around Xactly Analytics, which is a customizable reporting platform that is directly integrated with your data structure in Incent™, and Xactly Connect™, which is the primary data integration platform for Xactly. We hope these traits will help you evaluate your potential Xactly Administrator and help ensure you have the right team to maximize your ROI on the Xactly solution. Canidium has an Xactly-Certified team dedicated to implementing the highest quality solutions. Learn more at canidium.com/xactly. or simply go to our contact page to write us a message!